We’re not sure what it is, but there’s just something about 2012 and the new year’s ability to deliver can’t miss shows with exceptional local lineups. Don’t get us wrong, 2011 was no slouch but we’ve already had two shows where we wholeheartedly recommend every band on the bill and we’re not even a week in. It seems like we had to go weeks, if not months in 2011 to get to a show where we weren’t lukewarm about, if not dreading some act that would take stage any given night. The streak continues at Neumos tonight as everyone’s favorite Wilco-esque Seattle group Black Whales headline the night to celebrate the release of their latest video for Elephant #2 (below). The excellent Koko and the Sweetmeats will take the stage before the Whales and will no doubt get the room primed for even more sweet vocals with psychedelic instrumentation. Fans of straight-ahead sincere rock are especially encouraged to get their early to see openers Us On Roofs from Bellingham. 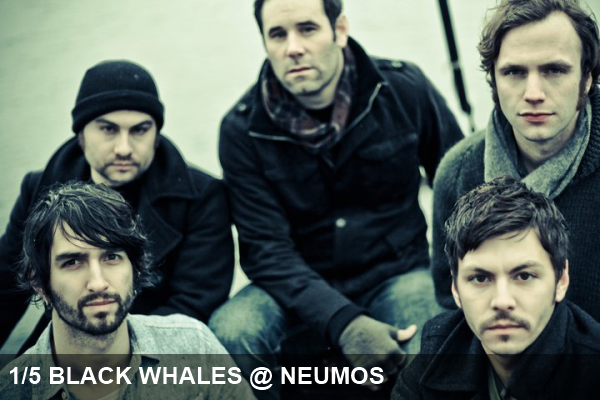 Yet again, 2012 and Neumos have teamed up to give Seattle music fans a night not to be missed. Look for us enjoying a Seattle dog or two after the show.